Sure, your hair looks fabulous when you walk out of the salon, but when you get home you are stumped on how to maintain your layered locks. The trendy, yet always-in-fashion hairstyle is simple to handle with the right products and tools. The layered style works well for both women who have long tresses and shorter locks because the layered look essentially frames the face and gives texture throughout the hair. The secret to maintaining your salon look is to know the tricks and tips of the professionals without paying the price. Wash and condition hair with products that are tailored to your hair type. Using products that work with your hair type such as thin, dry or normal will help to add volume or shine to dull locks. In addition, if you have hair that frizzes at the end of your layers then choose shampoos and conditioners that tame frizz and add straightening agents. Apply a heat-protection serum to your locks to keep frizzy hair away. Blow-dry your layers with a round bristle brush to keep layers going one way. Start with your bangs and work your way backwards. Set the blow dryer to medium-heat and lift at the roots of your hair. Dry the hair from the roots outward. Rub an anti-frizz serum in your hands and pull through your hair. Comb or brush your hair to distribute evenly. This will keep flyaways and frizz away for the duration of the day. Another option to the anti-frizz serum includes lightly misting your hair with a lightweight hairspray. Avoid using heavy-hold or medium-hold hairspray because it may weigh hair down. Create wavy locks with your layered hair by using hot rollers on dry hair, or Velcro rollers for wet hair. Roll the hair at the crown of your head to add volume and work your way forward and back. Spray the hair with a lightweight hairspray to secure the curls. When you remove the curlers, run your fingers or a paddle brush through your tresses to create waves and volume. 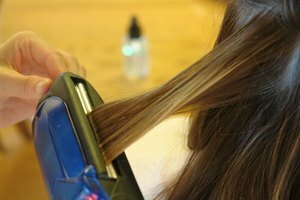 Turn your layered locks stick straight with a ceramic hot iron. The ceramic will help retain moisture in your hair and keep the frizzy hair away. Prior to ironing, apply a heat-protectant serum to the hair. The easiest way to straighten layered hair is to pull the top half of your hair upward and secure in a hair clip. Iron the bottom half of your hair first and then release the top and iron. Apply a shine serum to your hair afterwards to give your hair a sleek, shiny look.